Let’s face it; clogs happen. Toilets, sinks and bathtubs all get stopped up from time to time. It would be well worth a homeowner’s time to learn a few tips to unclog them. There are times that a plumber needs to be called in, but sometimes a DIYer can handle clearing a drain by himself or herself. One thing to remember is that if it doesn’t unclog with a moderate amount of pressure, it would be best to call in the professionals at MasterTech to prevent further damage. Some basic plumbing tools to assist in drain clearing should be on hand in the tool chest of every homeowner. Those basic tools are a plunger and an auger or snaking device. An auger can be manual or electric and is a metal cable with a crank. The “snake” is a version of the manual auger and is called by that name because it looks like its reptile namesake. The electric auger is a bit pricey for the average tool chest but renting one from the local rental store is an option. Kitchen sink: if your kitchen has a double sink, it’s important to put a rag or sponge into one drain opening in order to keep the suction pressure up. Filling the sink and plunging away may do the trick. If not, snaking it with an auger would be step two. 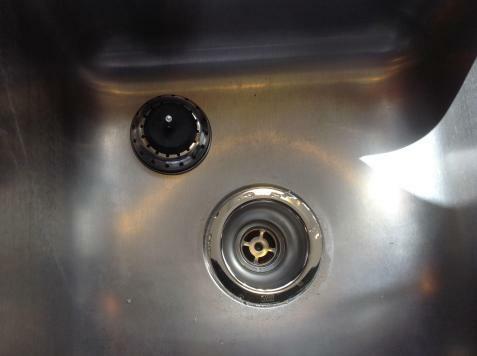 If there is a garbage disposal, removing all food debris and pushing the red reset button may do the trick. Prime culprits for clogging a garbage disposal are vegetable peelings such as those from potatoes, apples, carrots and more. It would be wise to peel potatoes and other veggies into the regular trashcan. Bathtub: Bathtubs usually begin to drain slowly over time due to a build-up of hair and soap scum. It’s wise to remove the pop-up and clear this mess occasionally in order to prevent a full-fledged drain clog. If this doesn’t work, it may be time to bring out the plunger or auger. Toilet: Toilets are the most common household fixture to require drain clearing. Preventative steps will often eliminate this problem but when clogs happen, the plunger and snake methods usually clear the trouble. Only putting appropriate items into the toilet in the first place will prevent the majority of possible clogs. Only human waste and small amounts of toilet tissue should be flushed. Children must be taught how much bathroom tissue is “enough” and to not flush toys, pets and Mom’s wristwatch. Other items like Q-tips, paper towels, sanitary hygiene products including tampons, pads and disposable diapers should never be flushed down the toilet. Slow or clogged drains are a common occurrence in any household. It is wise to stock some basic tools and become knowledgeable about drain clearing. If the problem persists after trying the above steps, call the professionals at MasterTech to clear the clog and get your drains flowing freely again. Russ is the owner and president of MasterTech Plumbing, Heating and Cooling. He started his own company, Inexpensive Plumbing, in 1990 and eventually transformed it to MasterTech. Being a Master Plumber himself, Russ is an expert in the industry. Thursday, 18 September 2014 Tankless vs. Storage: Which Water Heater Is Right for My Home?